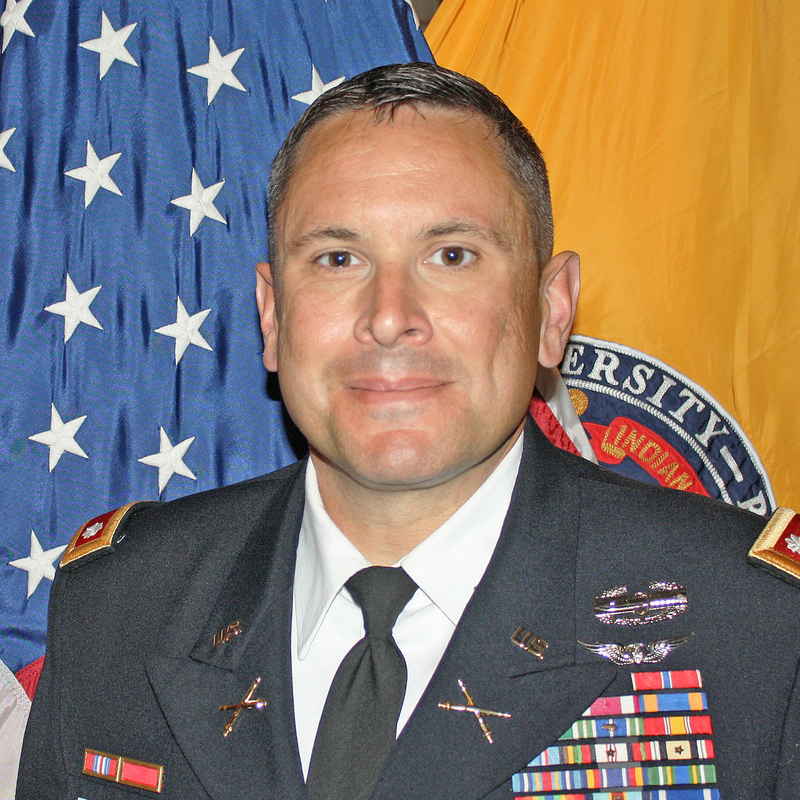 Lieutenant Colonel Tim LaBahn assumed his duties as IUPUI Professor of Military Science in July 2015. He commissioned as a Second Lieutenant in the Field Artillery following graduation from The George Washington University in 1997. He began his military career as Company Fire Support Officer and Battalion Ammunition Platoon Leader in the 3d Infantry Division at Fort Stewart, Georgia. He deployed to Bosnia-Herzegovina in 2000-2001 as a Targeting Officer and Information Operations Officer. Upon return from Bosnia, LTC LaBahn served as the Brigade Fire Control Officer for the 41st Field Artillery Brigade, Babenhausen, Germany from 2002-2005, including combat operations during the invasion of Iraq. In January 2006 he assumed command of Headquarters and Headquarters Battery, 2d Battalion, 32d Field Artillery in the newly activated 4th Brigade, 1st Infantry Division at Fort Riley, Kansas. He deployed again to Iraq in 2007-2008. In May, 2008 he moved to the Military Intelligence Detachment (JSTARS) at Robins Air Force Base, Georgia, where he served as a Deputy Mission Crew Commander on the E-8C (JSTARS) aircraft, flying Intelligence, Surveillance and Reconnaissance (ISR) missions in support of Operation Iraqi Freedom and Operation Enduring Freedom. In 2010, LTC LaBahn became the MI Detachment (JSTARS) Executive Officer. Upon completing U.S. Army Command and General Staff College in 2012, LTC LaBahn became the Executive Officer of the 1st Battalion, 15th Field Artillery at Camp Hovey, Republic of Korea. Between 2013 and 2015 he served as the 210th Field Artillery Brigade Executive Officer and Deputy Commander at Camp Casey, Korea. LTC LaBahn holds a B.A. in International Affairs from The George Washington University and a Master’s Degree in Management from Webster University.